Situated in the prestigious private resort home community of Champion Ridge, this beautiful retreat offers four spacious bedrooms and 360 degree views spanning the ocean, golf course and volcanic mountains. he house is just moments away from the Beach Club, golf course, grocery store and restaurants. Special features of the home include a huge covered outdoor lanai and living space with a private pool, hot tub, and grass yard. Relax on the sun deck and enjoy spectacular views of the Pacific Ocean and nightly sun sets. 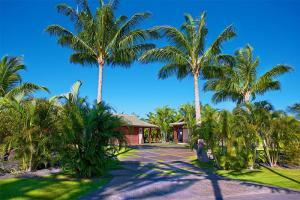 Situated in the prestigious Champion Ridge gated community and close to the private Beach Club.